How does solar energy stack up vs coal for electricity generation? In 2015, the United States used about 3,724,500 million kWh of electricity. Most of us don’t have enough context to realize how big this number actually is, so here are some facts: First off, the US is the 2nd biggest user of electricity in the world (just behind Canada). Secondly, think about what exactly this number includes: all the electricity used in millions of homes across the US for air conditioning, lights, refrigerators, stoves, hot water, and all our devices, as well as factories, office buildings, data centers, agricultural applications, government offices, recreation centers, football fields, streetlights, and about a billion other things we don’t even think about on a daily basis. With so much electricity being used and created every day, as a country we need to constantly assess if all this electricity is being created in the most responsible way, both monetarily and environmentally. Coal and natural gas account for most of this electricity, with nuclear and hydro falling in 3rd and 4th respectively. Renewables (not including hydro) account for 7% of total generation, with solar at just 0.6%. 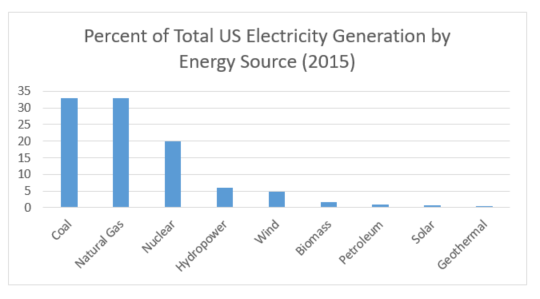 Take a look at the chart below, created from data published by the US Energy Information Administration, to compare the different energy sources. Just 17 years ago, coal made up 56% of all electricity generation in the US. In the last 15 years the electricity industry has seen a huge shift towards renewable energy, with solar and wind accounting for 52% of all new electricity generation in 2014 and 69% in 2015. During the same years, coal accounted for 1% and 0% respectively of new generation. Once the powerhouse of electricity generation, coal is in retreat, thanks mostly to the cheap availability of natural gas and the increasing popularity (and increasingly lower costs) of renewables. For the past 100 years, the electricity industry has been dominated by two main tenants: create electricity that is cheap and electricity that is reliable. That’s it. Utilities simply wanted to build a power source that people could rely on for everyday life and the companies could trust to keep their offices and factories running without question. Today, let’s compare coal and the all-popular ‘poster-child’ of renewable energy, solar to see just how they differ and which one comes out on top when we look at cost, sustainability, and ease of use. Keep in mind that we are only comparing coal and solar, not natural gas or wind, which are very popular options for new electricity generation these days. The winner probably comes as a surprise to most people, and there’s a very important caveat to this win that we’ll point out later. In 2013, the average construction costs for a utility-scale PV solar power plant was $3,705/kilowatt, according to the EIA, compared to $2,934 for typical coal power plants (and, for context, $965/kilowatt for natural gas – the cheapest by far). For coal plants with CCS (“carbon capture and storage”), a new type of coal power plant which avoids releasing harmful emissions (and which some see as the future of the coal-fired plant), the price skyrockets to $5,227. As you can see, there’s not a huge difference between solar and the average coal plant (natural gas is another story though and, in fact, many new power plants are natural gas powered). To be honest, comparing construction costs between coal-fired power plants and solar installations isn’t really useful, as no one is really building coal-fired power plants anymore and the majority of those that are still in existence are past their 30 year expected life span and are due for retirement in the relatively near future. Much more relevant is the ongoing operating and fuel costs of the two different energy sources. Energy Innovation, a renewable energy think tank, created an interactive graph from a study by Lazard, an international asset management firm, of the levelized cost of electricity (LCOE) from different energy sources, including coal. LCOE allows us to accurately compare the cost-effectiveness of different energy sources in a meaningful way. As we found above, Lazard researchers also found that construction costs are similar for solar and coal power plants. However, after construction is completed, solar costs just $8 per megawatt/hour for operations and maintenance and, of course, solar has no fuel costs. Coal, while certainly cheaper than other fuel sources like fuel cells or biomass, costs $21/mWh for fuel and $12 for operations and maintenance, totaling $33 per mWh – 4x the price of solar’s ongoing costs. It’s important to remember that these costs are for utility-scale solar power plants, not residential solar installations, which see much higher construction costs than both utility-scale solar as well as coal-fired power plants. In addition, solar production is quite variable and for it be adopted on a wide scale needs to be coupled with a storage system, which is quite expensive (see the section on Reliability and Controllability). When the costs of coal are compared to solar coupled with storage, coal is by far the cheaper choice. However, probably surprising to many, without any storage, solar is the more cost-effective option for utilities looking to construct new power plants. Subsidies are fairly hard to track down and account for, especially in the coal industry, as most aren’t a direct rebate or credit upfront but instead are through a variety of credits, breaks, loans, bonds, and other funding. We often hear that the solar industry is propped up by local, state, and federal financial subsidies and this is certainly true. Through the Renewable Energy Tax Credit, the federal government provides a 30% tax credit to the owners of solar installations. The federal government also subsidizes utility-scale installations, including $1.6 billion for the Ivanpah concentrating solar power plant in southern California. Each state, city, and county also offers a mix of tax credits, upfront rebates, property tax exclusions, and net metering credits. New York State’s Solar Energy System Equipment Credit is one such state tax credit, lowering the total installation cost by 25%. 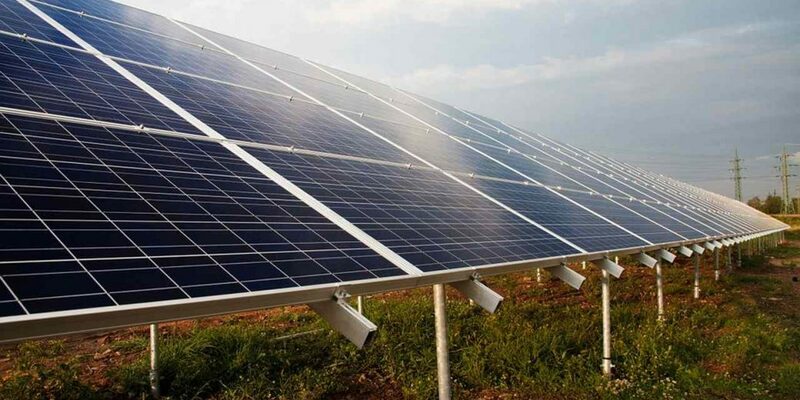 Tax credits and incentives for commercial solar are also quite common. The importance of each of these financial incentives to the industry was illustrated in early 2016, when the state of Nevada allowed utilities to lower the net metering incentive to solar homeowners. Despite the availability of other financial incentives, solar installers quickly left the state claiming they could no longer provide homeowners with cost-effective installations. Widespread tax breaks for solar are a relatively new phenomenon though. The federal government has provided huge financial breaks for the coal industry over the last 100 years that dwarfs any solar industry incentives. As subsidies for solar are seen as an investment in a cleaner future, coal was seen as too important of a commodity not to subsidize. A 2010 report from Synapse Energy Economics found the federal government provides billions of dollars in incentives for plant construction, exploration, and transportation in the coal industry, namely through tax credits, loans, loan guarantees, and bonds. According to the Sierra Club, the coal industry received $17 billion of federal subsidies between 2002 and 2008, with states also providing individual subsidies, with Kentucky offering up about $115 million and Virginia over $26 million. In the end, both the solar and coal industries rely on government subsidies, but coal certainly has solar beat when comparing the total amount of subsidies involved for the two industries. Most PV solar panels convert between 15% and 21% of the sunlight that hits its surface into usable electricity. The vast majority of the sunlight is reflected back and away from the solar panel. Some solar panels see efficiency as high as 40%, but the cost is simply too high for widespread use. Solar researchers are constantly increasing the efficiency of solar panels and even creating new solar technologies, like spray-on solar, that promise even higher efficiency. Coal-fired power plants, on the other hand, can convert about 30% of coal’s potential to electricity – the rest being wasted as heat. While coal’s efficiency is seemingly higher than solar, keep in mind that we have an endless supply of solar’s energy source, constantly streaming down to earth! Coal, on the other hand, must be mined, transported, processed and refined, transported again, then burned. When looking at each fuel’s total life cycle, solar starts to look pretty good! Utility-scale solar uses much more land than a coal-power plant, since each solar panel needs to face the sun and can’t be shaded by other panels. The 550 MW Desert Sunlight Solar Farm, for example, is one of the largest solar power plants in the world, with 8.8 million solar panels covering six square miles. In comparison, a similar coal power plant would use less than a square mile (though further down the food chain land is used for mining as well). Coal has solar beat on the efficiency test, though this could (and probably will) change in the somewhat near future. This is obviously where solar shines. While nasty chemicals (hydrofluoric and hydrochloric acids) are produced and used during the solar panel manufacturing process, and solar panels themselves are constructed from silicon (the universe’s 8th most common element) and rare earth minerals, once the panels are constructed and transported to the job site, they produce no emissions whatsoever and use no fossil fuels. Compare this to the average coal-fired power plant, which emits 3.5 million tons of carbon dioxide annually, as well sulfur dioxide, nitrogen oxide, and particulates. Coal-fired power plants released 1,364 million tons of CO2 in 2015 and are responsible for 43% of total CO2 emissions in the atmosphere. Coal power plants are also the largest source of mercury emissions in the world, spilling out into rivers, lakes, and oceans and causing fish, birds, and mammals difficulty in reproducing as well as finding food. Coal power plant operators can decrease emissions by making changes to both equipment and operations, leading to a more efficient power plant, but many have yet to take that step. Even still, it’s hard to imagine a coal power plant playing on the same field as solar. This is a short section, as it’s honestly not even a contest. Reliability is where coal has solar beat with its hands tied. It’s truly renewable energy’s Achilles heel. By its very nature, solar installations produce inconsistent electricity. They only produce power during the day. If it’s cloudy, production decreases significantly. Other than choosing how many solar panels to use in their installation, utilities can’t control the amount of electricity a power plant produces. They can’t make the solar panels produce more electricity when everyone gets home at 6PM and cranks up their air conditioning, oven, and TV. If a storm rolls in and the electricity the solar power plant is producing suddenly drops off, the utility must find a way to fill that hole. Batteries pair well with PV solar and the solar industry is furiously developing batteries in response to this issue, looking for ways to both increase their storage capacity while dropping prices. Tesla’s Powerwall is a prime example of where batteries are moving towards: a sleek, easy-to-install piece of equipment that is fairly affordable for what is packed inside. In areas with high electricity prices, specifically Hawaii, many homeowners are already installing batteries with their solar installations and small solar panel kit systems as a cost-effective alternative to utility power. Coal-fired power plants, on the other hand, are ubiquitous in part because they are so reliable and controllable. Utilities can ramp up or lower production as needed and they’ll always know exactly how much electricity will be produced, no matter if it’s sunny, rainy, snowy, or anything in between. For solar to really flourish as something we rely on day-in-and-day out, it must be coupled with a cost-effective storage option. We know exactly what we need and the solar industry is working hard to get there, so solar plus storage is an option for all homeowners. Simply put, solar and renewable energy is the future. While admittedly we don’t have all the kinks worked out quite yet – solar panel efficiency could be pumped up a few percentages and batteries need to drop considerably in price – solar energy’s lack of emissions, continually falling prices, and free fuel source move it into the winning slot. And considering our current extremely high emissions levels and the climate issues we created and now need to address, the winner isn’t a choice but a necessity and now we simply need to figure out how to fix the challenges to solar so it can be adopted on a wide scale.